Refusing to write letters of recommendation for political reasons violates university policy, Schlissel stated. 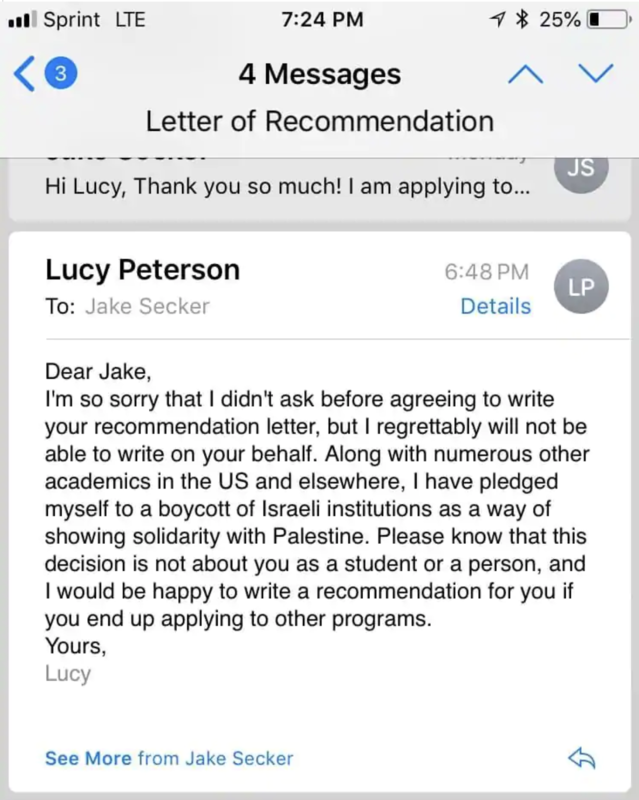 In these days when many academic institutions either overlook the demonization of Israel or let their Jewish students twist in the wind, this is very refreshing, and I’m proud of UM. (Note: I’d be just as proud if a University did the same thing for its Palestinian students—or any students whose careers or goals are impeded by the ideological bent of the faculty. This entry was written by whyevolutionistrue and posted on October 10, 2018 at 10:15 am and filed under anti-semitism, professors behaving badly. Bookmark the permalink. Follow any comments here with the RSS feed for this post. Both comments and trackbacks are currently closed. The worst since Boxing Helena. I thought the worst was The Black Night. Wow that is quite the punishment. I guess U of A found it embarrassing as no institution enjoys that sort of attention. I hope the TA is straightened out. I really find this trend terrible. I’m glad I’m not the only one who sees nothing in most screenshots but a battery in need of charging. They stated he violated his contract which was the appropriate response. My prior questions had to do with what basis the university would use discipline the professor. It would have to be for a violation of law or contract violation. Agree that he should not have been fired. As why any one eould boycott Israeli institutions, especially a professor at a state university, that is very difficult to understand. It shows how far removed from reality people in our society have become. We have become tribal and separated ourselves into tribes and groups with no empathy or attempt at cooperation or understanding. This is unfortunately particularly true in college campuses. I have gotten slapped down on this blog for asking for civility towards republicans and for calling people out for using offensive language toward various groups in our society. It’s not that hard to understand; they think Israel is acting in a terrible manner and seek to us their own economic pressure to get them to change. They compare it to South Africa under apartheid, and the world responded to that country’s policies through almost this exact method; boycotts. Most people outside that group don’t see the comparison as valid, which makes it hard to understand why boycotting is justified in this case. But there’s nothing difficult to understand about the strategy, since western countries – including liberal governments and conservative ones – have used it before. As to the why, I think they boycott as a form of signaling. Your (correct) observations about tribalism explain why. As BJ noted, this guy will now be a hero in some quarters, and there might even be a go fund me. I am sorry that you had that experience here. I do not know the particulars. Naturally there is a strong skew here toward the left and toward democrats, and responses over those with other views can look like one is being ganged up on. You know, I didn’t favor any punishment either at first, but UM’s statement brings up a lot of issues that simply didn’t occur to me, and some other information of which I was not aware. That last one is particularly nasty. This professor used a student and made them stand under the public spotlight so he could spout off about the evils of Israel. And he’s using class time to propagandize students so he can spread his ideology. I will note that the latter was not at all uncommon when I was in college, as I had many teachers who would suddenly talk about Israel, BDS, “Apartheid state,” etc. during unrelated classes, and that’s how I actually came to believe so many of the conspiracy theories they espoused. I was a young, impressionable college student who looked up to my teachers, and they regularly used class time to brainwash myself and others about the evil of Israel. So, after reading that, I think a harsh punishment was in order. But what’s next? I have a feeling that now tons of professors at UM — perhaps across the US (and even the UK) — will do the same thing “solidarity” with Cheney-Lippold, and that there may be student protests over all of this (we know exactly which side the protests would support). There’s even a good chance that Cheney-Lippold and others like him will get celebrity and money out of this. I hope the brass at the University of Michigan made it clear to all instructors and Department Chairs, not just Cheney-Lippold, that this type of conduct is not acceptable. The letter made it quite clear to Cheney-Lippold that using his position to punish students for not adhering to his politics will not be tolerated. Good! Perhaps no further punishment is needed unless he does it again. In large part I view this as an institutional failure, widespread in the academic world, that lets faculty think that “academic freedom” permits this sort of thing. This seems a bit strong, as surely one could support a boycott on Israel not from hatred of Israel, but as a protest against current Israeli policy with regard to Palestinians. Just as those who supported a boycott against apartheid era South Africa were not anti-South African, just against the policies towards non-whites. I’m glad you’re not comparing them. The BDS movement has no such compunctions, though. It’s a facile and ignorant claim and made primarily by anti-semites. Even if some memebers of BDS movement do not know that the leaders of the movement are against the existence of Israel in any borders (it’s possible to be totally ignorant of the goal of the movement one is a memeber or supporter of) they most probably can hear the chant which is present at every BDS event: “From the River to the Sea Palestine will be free”. The implication of this chant is really very simple: no Israel between Jordan River and Mediterranean sea. In other words this is a call for genocide of 6.5 million Israeli Jews. This doesn’t look like a quest for justice for anybody but like hatred of Israel. Unless they really don’t understand what they are shouting which is really quite difficult to believe. I agree with Malgorzata, mostly, but in their defense I will say most protestors don’t understand what they are shouting, in general. It’s herd behavior. I don’t know about that. If one knows anything at all about the situation (which they should, if they’re protesting in support of one side of it), they know that the Palestinians believe that the Israel should be completely destroyed and that killing any Jew is an enormous and godly achievement to be celebrated and compensated. He has researched it so carefully he doesn’t know his own university’s policy. I invite you to speak to protesters some time. Any protest at all. Few can tell you much coherent and specific about why they are there. (Except the Westbrook baptists, who know exactly whom god hates of course.) broad answers like “I hate Trump” or “To show support” or “Hillary is a crook” count to my mind as evidence of herding. I recall one such protest in Ann Arbor. After spouting the to the sea line I asked a woman about what would happen to the Jews. She was at a loss for a while, and said yes that’s a problem but … then she chased after me begging me not to think her an antisemite! But she hadn’t even thought out the simplest implications of what was on her placard. You make a fair point. But, regarding the woman in the last paragraph, do you think she changed her mind after realizing that the consequences of what she and her fellow travelers were advocating might be genocide? Unlikely. Still, you’re likely right about most people not thinking much about it. Then again, I remember all of this on my college campus, and I remember the people who were into it having regular discussions about it, so it’s not like their thinking was merely slogans and “I hate Israel.” There was a lot of talk about conspiracy theories presented as facts (even from professors in classes) and about the evil of Israel and the good of Palestine. Color me skeptical of the “talk8ng about it”. I have watched a few such discussions. No dissent, no testing of assumptions. Like you describe. Protests are mostly a social activity. My understanding of the BDS movement is that they show two faces to the public. Within Palestinian lands and elsewhere in the Middle East, they are unabashedly anti-Semitic to a degree that it is hard not to notice. But their message within Western lands where they try to come off as oh-so-reasonable but victimized people. If this understanding is true, then I can at least see how less informed Westerners may be snookered into impassioned support for the BDS movement. Calling for the end of the state of Israel is not necessarily calling for the deaths of all its citizens. I wouldn’t be at all surprised if many of the protesters have convinced themselves that Israel will be given back to Palestine to rule and everything will be sweetness and light and the Jews living there will coexist in harmony with the Muslims. In reality, of course, it would be something of a blood bath. I think Lucy Peterson put her foot straight into it. She clearly states why she’s withholding her recommendation. What goes for Mr Cheney-Lippold obviously should go for Ms Peterson. (And I think that the sanctions to the former are justified). Look, there is quite a bit about the policies of Israel I’m not happy with -I guess most of us are-, but the comparison to the South African Apartheid regime is neither here nor there, there simply is no comparison. It is like comparing a cold to breast cancer. I am very surprised, since UM has been very squish on regressive stuff in the past. Maybe this was too overtly anti Semitic. I’m with the father, but this is certainly more than just a slap on the wrist, so bravo. So what is the purpose of punishing Cheney-Lippold at this point? Retribution? Once it is made clear to ALL instructors that this conduct will not be tolerated and punished in the future, I see no need to punish Cheney-Lippold. Does the University of Michigan really need to set an example? Do they need to set an example? In a word, yes. oops. For some reason I hit post before I finished my thought. If they didn’t punish him the message would be to all involved; “we’re really serious about this so don’t do it again, ‘wink’ ‘wink'”. I was in academia for forty years. A strongly worded letter from the administration is all that is needed. Well it’s a good thing the Pope put out a strongly worded note on child abuse. That was a serious problem before he solved it so easily! The Pope isn’t the dean at a University. He’s never sent a strongly worded letter with an official warning to a specific individual (as far as I know). Child abuse is not the same as a fairly minor political act. In short, the analogy really doesn’t work. In my opinion, a letter of reprimand is a reasonable response to a first offence. The professor may not even have been aware of the University policy. This could be viewed as a mistake on his part. I tend to agree now that I think of it. A policy without any means of enforcement, or any sanction for violating it, is a toothless policy. But I wasn’t going to tell UM what to do. In short, Prof. Cheney-Lippold appears to be a standard communicant of Grievance Studies. Discriminating against Israel, and any student who wants to have anything to do with Israel, is simply an emblem of his membership in this coterie. Grotesquely, this is now identified (and loudly self-identified) as “the Left”. Those born before last week will remember a time when Leftists would have been outraged at any proposal for academic boycott of the USSR “in solidarity with” Finnish Karelia, Lithuania, Latvia, Estonia, Hungary, and Czechoslovakia, not to mention the Chechens, Ingush, and other groups the USSR subjected to mass deportation. But back then, the idea of academic boycott would have appeared too outlandish. Today, the idea of academic boycott is applied against only a single country on the planet. That is an interesting point that I had not considered. But I suppose there was never a well-funded and appealing-looking anti-Soviet union movement at the time. Ironically, there is sort of an anti-Russia movement in democratic circles now, while those at the top of republican power are hoping to make it go away! Also, have you mentioned that those pro-Palestinian Westerners whose hearts apparently bleed for stateless Middle Eastern Muslims never give a damn about the plight of the Kurds? This is a very good point. If you are going to disengage from Israel in academia, business, culture, whatever, then what can your policy possibly be towards China, Saudi Arabia, Egypt, Bahrain, (and come to that Palestine itself)?…add your own candidates. Once again, the only democratic country in the Middle East, although it has its manifest faults, which deserve calling to account, is singled out for punishment. With such outstanding academic credentials, I wonder why the student turned to him for recommendation letter in the first place. Lara Alqasem, a 22-year-old U.S. citizen with Palestinian grandparents, landed at Ben-Gurion Airport last Tuesday with a valid student visa. But she was barred from entering the country and ordered deported, based on suspicions she is a boycott supporter. Alqasem is registered to study human rights at Israel’s Hebrew University in Jerusalem. “If Alqasem comes forward tomorrow morning with her own voice, not with all sorts of lawyerly sophistry and statements that could be construed this way or another, and declares that she now thinks supporting BDS is illegitimate and she regrets what she did on this matter, we will consider our stance,” Israel’s strategic affairs minister Gilad Erdan said. That is appalling. The heavy hand of gubmint. BDS is misguided and rife with anti-semitism, but this kind of thing goes to far. Abend-David is her Hebrew instructor, fercryinoutloud. I’m not appaled. Every country has a right to bar people who are working against it. Ms. Lara Alqasem on top of being fervent BDS supporter is an active member in Students for Justice in Palestine (SJP), and organization which supports terrorism and murdering of Jews, disseminating most vile lies about Israel. She defended stabbing of a 15-year-old Israeli boy and accused Israeli soldiers of “murdering” his attacker. SJP supported Samer Issawi, a prisoner in Israeli prison with much blood on his hands, and many other killers of Jews. Now her supporters disseminate lies that she is “detained” in Israel. She is barred from entering Israel and is free to leave any moment. Nobody is detaining her. Israelis have every right not to want to have this person in their country. Well now who should I believe? According to the article James posted the young woman is no longer a member of the group and the only activism she was involved in was trying to boycott a kind of hummus. You’re right that any country has the right (and obligation) to control who may visit, but if that article is to be believed, in this case it seems very heavy handed. But if what you say is true…. I will withdraw the appall. As far as I know she was the president of the chapter of SJP at her university until 2017. It’s possible she is no longer a member. But during the time she was her organization supported murderers. Did she ever renounce her activities? I’ve seen no evidence of it but possibly she has done it in secret inside her soul. Israelis have as little chance to know this secret as I do. I agree, but they should not have issued her a visa. I’ve put an update at the top of my post: the UM President has apologized to both affected students, chastised not only Cheney-Lippold but Peterson, and promised to help both students complete their applications, presumably with good recommendations. It’s time to push back against the Israel demonizers who try to hurt students’ careers in service to their own ideology. I am agnostic about the boycott of Israel, mainly because I haven’t seen that it is effective in resolving the conflict. I also have mixed feelings about punishing someone for following their conscience, even when I don’t feel the same way. Conscientious acts have been recognized as ethical behavior since before the founding of this country. I participated in the grape boycott that started in the 1960s, not because I was anti-farmer, but because I thought they should pay farmworkers better wages. In the same way, I don’t see that those who boycott Israel are necessarily anti-semitic, though they might be. However, I don’t think it is justified to assume that someone participating in the boycott is against the state of Israel. They may just be against particular policies of Israel, just as I am opposed to some policies of my government, which doesn’t make me anti-American. I happen to agree and so it seems to the people at the Foundation for Individual Rights in Education, this is one of those nasty grey areas that people don’t like to look into because the answers are not easy to find. Then again, speaking from personal experience the BDS movement has produced some pretty ugly sophistry. I hope to never again have to confront someone who believes that putting the word ‘Israeli’ in front of a call for Jews to be burned alive makes it an acceptable political statement. Am currently working on another piece regarding Peterson. Methinks that UMich administration people need some testosterone shots.